This process copies time-depth pairs from another well. From the Tool menu, open Synthetics. 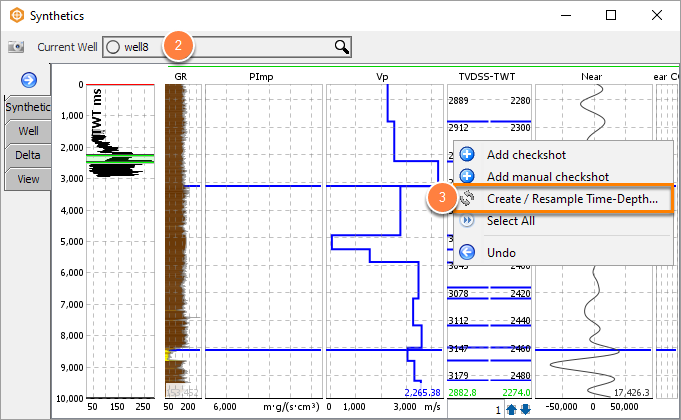 Right click on the checkshot track and select Create/Resample Time-Depth Survey. 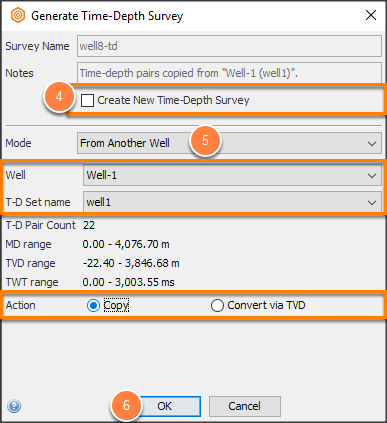 Tick the Create New Time-Depth Survey option to create a new survey. Otherwise the active time-depth survey in the well will be overwritten with the newly created one. At Mode, select From Another Well. Well: The source of the time-depth set. T-D Set name: Copy this set of time-depth pairs. Copy: Make an identical copy (MD-TWT). Convert via TVD: Match interval velocities by converting to TVD before copying (TVD-TWT). Time-depth pairs are copied from one well to the other without changes. I.e. If the originals are in (MD, TWT), the same (MD, TWT) values are used. For deviated wells, this will result in different interval velocities. Time-depth pairs from the original well are first converted to TVD, then copied to the new well. I.e. If the originals are in (MD, TWT), the resulting time-depth pairs will be different. For deviated wells, this will preserve interval velocities.